Ever since I went to Thailand I’ve become obsessed with sheet masks. They’re so fun to pamper yourself with and they are a-m-a-z-i-n-g for your skin. My skin always feels baby soft after a good mask. Wearing a mask also forces me to schedule in some me-time. We’re always so busy, we often tend to forget to treat ourselves and take some time off. That’s why I just love sheet masks. I can read my favorite book, watch a tv-show,… all whilst taking care of my skin. Isn’t that just great?! If you saw my Thailand Beauty Haul, you would have seen how big my sheet mask collection is. 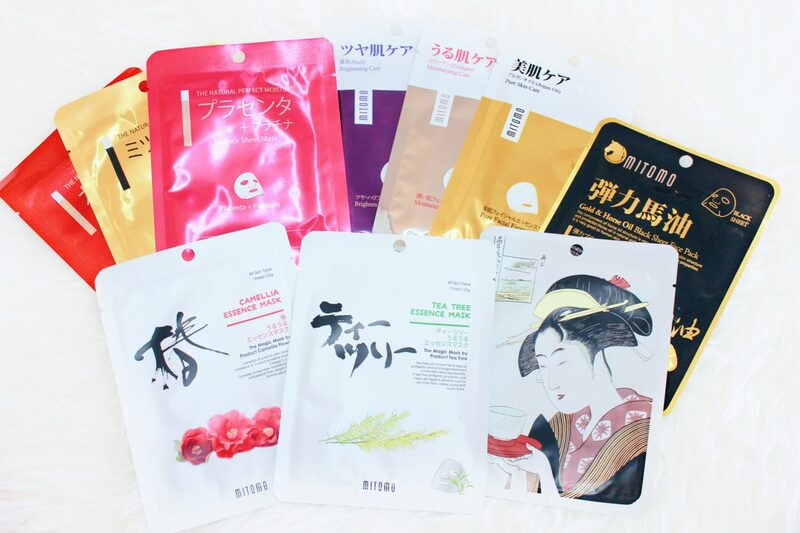 As of recently, my collection has grown even more after Mitomo send me a few of their sheet masks to try. I was so grateful to have received these in the mail that I immediately put them to the test. 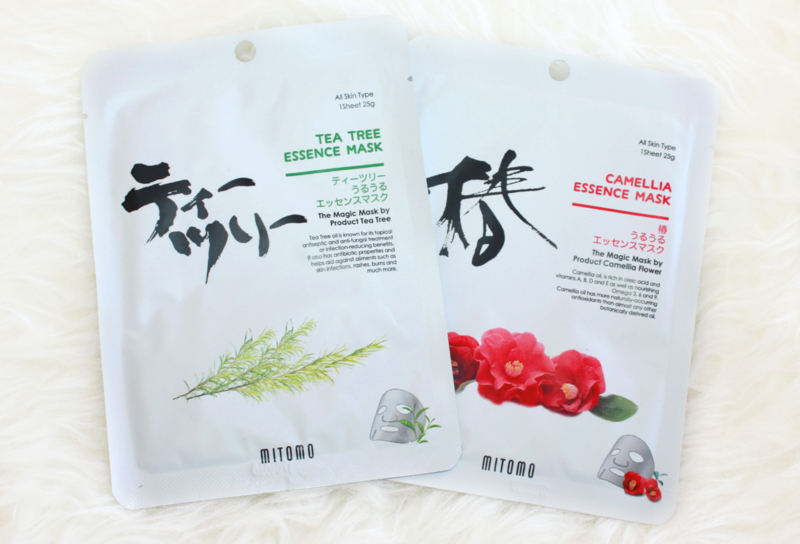 Mitomo is a Japanese brand that offers high-quality masks that focus on health and beauty of facial skin. Their masks are made in Japan, with a wide range of masks to suite different skin-types. The mysterious Japanese culture is also found in their gorgeous packaging, which is just to die for! First up, they sent me two masks from their Magic Essence Mask range. The Tea Tree Essence Mask is perfect for those of you suffering from burns, skin infections, acne,… because of its skin-soothing and antioxidant properties. However, if you’re more my skin-type and can always use some deep hydration, the Camellia Essence Masks would be your best fit! The flower symbolizes feminine beauty (a treasured secret of the geisha), while the oil is lightweight and deeply moisturizes the skin. I have to be completely honest, the Gold & Horse Oil Black Sheet Face Mask scares me a little bit. Even though I’m not a vegan, having ‘horse oil’ on the packaging doesn’t exactly sound appealing to me. The gold is supposed to make the skin more radiant since it boosts the production of collagen. Horse oil is supposed to reduce inflammation and peeling skin. This all sounds pretty amazing, but so far I haven’t actually used this mask. The mask on the right is the Q10 and Lithospermum Mask. I can’t wait to actually try this mask, as it has anti-aging benefits to it. Q10 is a natural antioxidant that promotes skin renewal and therefor signs of aging. I have been noticing a few wrinkles here and there starting to get worse, so I can definitely use some of this magic! 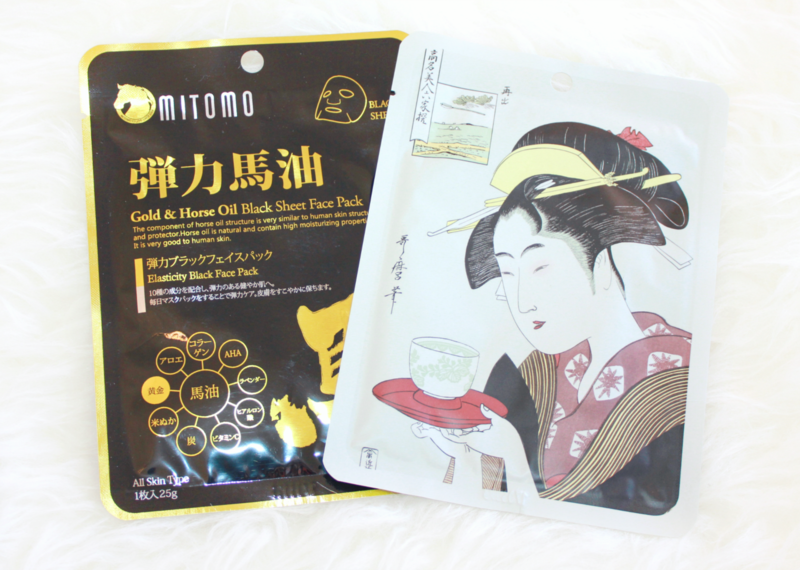 Mitomo also has a Natural Perfect Moisture Essence Sheet Mask range, from which I received three different varieties. The Placenta + Platinum Essence Sheet Mask is a firming and smoothing mask. Placenta promotes the production of collagen, elastin and hyaluronan, which is what makes the skin feel so soft and smooth. Now, I don’t know what this Placenta is derived from, but again, it sounds a bit scary to me! The Platinum, on the other hand, contributes to skin rejuvenation. The Snail + EGF Essence Sheet Mask is a more revitalizing mask, but again, the snail part isn’t something that particularly sounds good to me. Epidermal Growth Factor promotes the formation of new cells, which I can really use after my vacation in the burning sun. I also received the Bee Venom + Gold Essence Sheet Mask, which has the best claims in my opinion. Gold promotes the production of collagen and elastin, which contributes to the skin looking more radiant and moisturized. Bee Venom stimulates the same things, but also firms the skin. My skin can definitely use some radiance and firming! 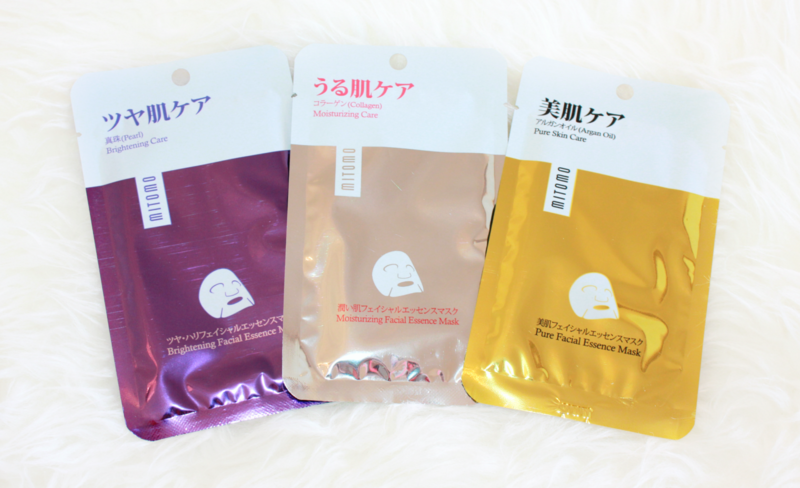 Lastly, we have three masks from their Care Facial Essence Masks range. First up, we have the Brightening Care Facial Essence Mask, which mainly contains Pearl. Pearl is responsible for moisturizing the skin and stimulates the skin’s regeneration process. It also helps to get rid off pigment spots, which I definitely have a ton of! It’s also a great mask for more mature skin. The Moisturizing Care Facial Essence Mask contains the popular skincare ingredient, Collagen. Collagen is responsible for a constant regeneration of skin cells, which makes the skin become smoother and firmer. If you want your skin to look younger, this is the mask for you! Last but not least, the Pure Skin Care Facial Essence Mask contains another popular skincare ingredient, Argan Oil. Argan Oil is known to renew the skin and reduce signs of aging. Argan Oil absorbs quickly into the skin and doesn’t clog any pores, which is why this mask is great for dry to even more oily skin. So far I’ve only tried three Mitomo masks, but I have to say I was very pleased with the results! The sheets are made out of high-quality material, but it’s super light-weight on the skin. They stay in place and thanks to the many little cuts, they’re easy to adjust to my face shape. I also love how there’s eye flaps since it nourishes my under-eyes without getting too close to my actual eyes. The ones I’ve tried so far are the more hydrating masks as my skin is pretty dry at the moment. They’ve done an excellent job at moisturizing my skin and my face looks super healthy and radiant afterwards. The Mitomo masks are sold through different (online) retailers (Douglas being one of them), but you can also purchase these on Amazon, where they retail for about €3 per sheet, or you can also buy them in packs of 10. Sheet masks can be quite expensive at times, which is why €3 is a pretty decent price if you ask me! This product was sent to me for review purposes. All opinions are my own.